Numerous studies have shown a link between smoking and alcohol consumption, and new research has come to light that further explains the association. Previously, it was discovered that 85 percent of drinkers were also nicotine-dependent. The latest findings, which come from the University of Missouri School of Medicine, reveal that the association comes from the effects of smoking that cancel out the sleep-inducing effects of alcohol. Dr. Thakkar has been studying the sleep-inducing effects of alcohol and nicotine for over five years. His previous studies found that nicotine and alcohol increase the pleasure effects by activating the reward center in the brain, which leads to more alcohol consumption. For the latest findings rats were strapped with sleep-recording electrodes and given alcohol and nicotine. Their findings unveiled that nicotine counters alcohols sleep-inducing effects. Smoking has been found to be a factor for alcoholism and the World Health Organization estimates seven million deaths a year are linked to alcohol and nicotine use. 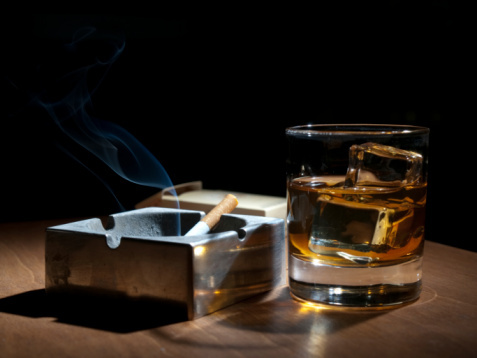 The findings can help improve health for smokers and drinkers as well as those with mental disorders, such as schizophrenia, which is closely linked to smoking.